Christmas decorations are great and they are an especially charming part of our experience of Christmas. Our diverse cultures within the Church can bring us rich traditions here. For example, Ukrainians and Poles and Germans may all have their own traditions when it comes to Christmas decorations. Certainly, as Catholic families, we should be mindful not to put up our trees too early (or to take them down too early, for that matter!). But then there is the matter of the ornaments themselves on our Christmas trees. Do our ornaments reflect the real reason for the season that we celebrate, or are they more commercial, stripped of any real or authentic Catholic culture? Is our tree loaded with Santa or Saint Nicholas? Is it more elves than angels? If someone were to look at our tree, would they know that we were Catholic? But how do we make our tree more Catholic? Well, obviously one thing we can do is to choose more Catholic ornaments. Admittedly, it isn’t always possible to find religiously-themed Christmas ornaments these days, as the stores don’t always give us these options, and it can take years to collect them, scooping them up whenever we are lucky enough to find them. While some of us might already have a treasure trove of heirloom Christmas ornaments of a more religious theme that we inherited from earlier generations or collected over the years, other families might also choose to make their own traditions and heirlooms. One idea is to look at the feasts we celebrate throughout Yuletide as Catholics and try to find or make ornaments for those days. We might call these our Yuletide Saints (St. Stephen, St. John the Apostle, the Holy Innocents, St. Thomas Becket, the Theotokos, Saints Basil the Great, and Gregory Nazianzen, St. Genevieve, Mother Seton, St. John Neumann, Brother Andre Besette). 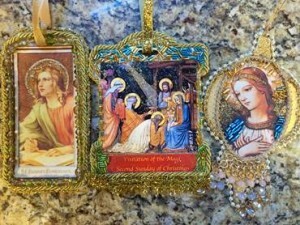 As these saints’ feasts fall during the twelve-plus days of Christmas, let’s find a way to put them up on our trees. But not every feast day in Yuletide is of a saint. Christmas also includes certain mysteries, or epiphanies of the Lord. These are feasts that ask us to reflect upon events in the life of our Lord (His birth, the visitation of the shepherds, the Feast of the Holy Innocents, the visitation of the Magi, the Feast of the Holy Family, the Lord’s circumcision, His presentation in the temple, the flight into Egypt, the wedding feast of Cana, and finally the baptism of the Lord). So, we could find or make ornaments to depict these themes of the season on our tree, too. But how? Well, some folks carve. Other folks do needlework. Some do ceramics. Some might paint miniatures. Others might look for inspiration at ex-votos or milagros. You might look for stuff around the house (old Christmas cards, beads from a broken necklace, lace from an old baby blanket, some left over velvet ribbon). There are many places to find inspiration. It may take years just to make a dozen or so (but if you like the ornament you make this year, then you could always make more, and give them away to your Catholic friends, too). Certainly, the computer makes it easy to find vintage art associated with these saints or feast days, and in craft stores we can find ways to make ornaments out of these images, if we’re clever. Our ornaments pictured above were made by our parishioners here. One easy solution is to take images from the internet, photocopy them, and label them on one side with the saint’s name and feast day. Then mount them onto a cardboard or wooden shape and adorn them with ribbons, beads, lace, or other things to make them all the more charming. If you pay attention, you might notice ornaments like these here and there scattered among the other ornaments on our beautiful parish Christmas tree in the Narthex this year. The ladies of the parish helped with these, and we think that they are as handsome as any we could have bought in a store (indeed more so). With ornaments like these, we can begin to make our trees more Catholic, and use these ornament to teach our children about the Faith as we decorate the tree year after year. The presence of these saints on our tree also reminds us that for us as Catholics, Christmas is not just a day, but a season filled with feasts to celebrate! Just as the candles on the Advent Wreath mark the passing of that liturgical season, these ornaments can help us mark the passing seasons of Christmas and teach us to savor the sweetness of God’s grace. Some families, based on their ethnic heritage, might find other saints whose feasts fall within this cycle more appropriate, but this seems to be a good list to us. It is a mix of old world and new world, east and west, well-known and lesser-known, ladies and gentlemen. It may take a family years to make ornaments for each of the days in Christmastide, and they might choose to start with the more well-known and eventually make enough for all of them, but in learning about these saints as a family, and in remembering them every year we decorate and un-decorate the tree, and marking the days of the Yuletide as a family, we can pass along, once again, our great Faith to the next generation.